Four years after the introduction of the Salter, the small Salter company introduced a new model: the Salter 6. 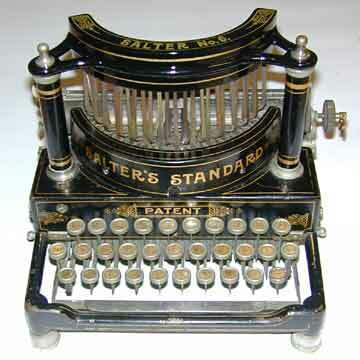 With this machine, Salter dropped the curved keyboard in favor of a straight keyboard. The Salter 6 did have two impressive pillars that carried the cover over the typebars, giving the machine an almost architectural appearance. The Salter 6 remained in production for a full six years, until the Salter 7 was introduced in 1907. The Salter 6 shown in these pictures is the only known remaining sample of the original Salter 6. It is not known how many of these were made. The serial number of this Salter 6 is close to that of the last known Salter 5 that still exists. The machine differs in many respects from the Improved Salter 6 that appeared soon after this model. - The name on the front of the early Salter 6 is "Salter's Standard". The later machine says "Salter Standard"
- The lower edge of the frame is straight on all sides and the machine has relatively high plated feet. The Improved Salter 6 had a curved frame edge. - The early Salter 6 does not have a rod and handle to roll back the ribbon, as found on the improved model. - The carriage structure was changed radically on the improved model.